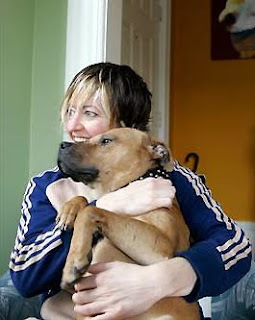 A rescued pit/lab named Juno owned by a regular here (NYCKitten) passed on to peace last Friday after 14 years of service. Fourteen years! I only know them via cyberspace, but they played in my thoughts all weekend. I can only imagine how hard it was for both parties to say good-bye. 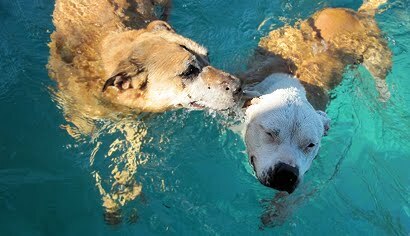 Dogs just love physicality, and it's certain that Juno enjoyed every minute of hers thanks to her person's devotion and care. Keep it in motion. We all need to move our joints in order to, well, keep them moving. Regulate an arthritic dog's exercise so they don't overdue it and become discouraged by their pain...Two shorter walks a day for them is perfect. Extra stiff bones will appreciate a wake-up massage to warm up the tissues that tighten overnight. It's become a morning ritual for Simon to nudge up on the bed at sunrise and ask for his massage - and we both love waking up this way. Plan for the inevitable loss of hearing by reinforcing eye-contact ("Watch me") early on and by incorporating a few important hand signs into your daily conversations with your dogs. I didn't realize how much influence signing for our fully-deaf boy Honky Tonk would have on our hearing dogs until they started going deaf too. What do you know? They already understood many of his signs! 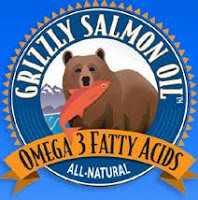 So, onto the next best diet tip... Grizzly Salmon Oil. 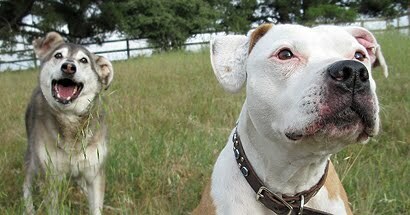 Our dogs have been salmon oil junkies since our pit bull Sally was diagnosed with mast cell cancer nearly five years ago. It's an anti-inflammatory, so helps with joint issues while helping the body grow a soft, lush coat. We buy ours from KV Vet Supply for cheap with their 10-bucks-off coupons. Cod liver oil is an alternative to salmon oil, especially as we learn more about the contaminants that are showing up in fish. (WAH!) Most people already know about giving their dog glucosamine for curbing osteoarthritis. Start young, stay consistent. Trader Joe's sells it for dogs for nine bucks a bottle. Bladder control. This is one of the best tips EVA, offered by the inimitable Susi Ming, who cares for seniors through the Bully Haven project. Powdered corn silk tablets (cheap, cheap!) are like a wizard's magic trick for strengthening leaky bladders. Two tabs sprinkled on each meal, and my dog's old once-leaky pisser is back to young-dog-mark-the-whole-neighborhood normal. I'm so relieved. Yeah, we're told it works for people bladders too. Hallelujah - maybe our dogs can show us how we can get old with dry pants! The Princess and the Pea. Sula bust dog represents. Oklahoma Annie did a great job representing today in a news interview alongside Sula Foundation's Ken Foster. She sure is getting around. Photographed here for a greeting card ... The bust dog turned princess is trying out dog beds in a local store. Do you think she felt the pea? New Orleans sure needs these guys. The city was emptied of pets after Hurricane Katrina in 2005, but spay/neuter efforts were a bottom drawer priority while nola focused on rebuilding itself and - No surprise - Nature had her way and a new population of pets was born nearly overnight. Now the city is back to where they started, with - once again - pit bulls over-represented and filling the shelter, just like the old days. 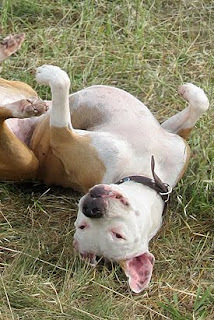 The Sula Foundation is helping pick up some of the slack by getting out to the communities with shots fairs and appointments for free spay/neuter for pit bulls. Buy their calendar and help these guys do their good deeds. This toothless, broken jawed old timer wears the definition of grateful on her sleeve. She's from the big summer bust and she came into the Oklahoma shelter without a whole lotta options. Can you just imagine how happy she is to be in real home right now? She's meeting her new person in this photo. What are you grateful for this Thanksgiving? 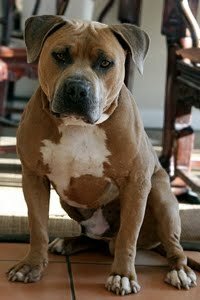 It's been a big year for pit bull advocates and seems hard to settle on one thing to bow heads about. We'd love to hear yours. 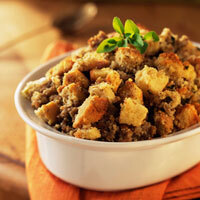 Happy Thanksgiving from all of us in BADRAP. Here's a suggestion that will help you get back to your errands and make a lot of dogs and people very happy on Turkey Day. When you cook up those yams or make up your famous stuffing recipe or mash those potatoes, set aside a small portion in a bowl before you add the seasoning. That little stash of good-stuff is going to be a big hit to some lucky dogs. 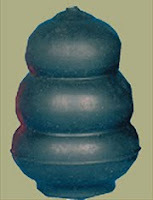 Dig out those unwanted kong balls that have been collecting dust bunnies under the bed, wash'em out and stuff them with a layer of your T-day goodies and maybe some cottage cheese or yogurt to top it off. Pop the lot in the freezer on Wednesday night, and map out a plan to escape your relatives for a few minutes on Thursday morning. While most of the country will be waking up to the Macy's parade and kitchen chores on Thanksgiving, your local animal control workers are going to be knee-deep slogging sh*t in crowded kennels and feeding a shelter full of hungry dogs. If they're lucky, they may have a box of milkbones to dole out to the orphan crew before they go home to their families. But if they're REALLY lucky, they'll have some of your exquisitely stuffed kongs to pass out to the neediest dogs. If you end up doing this, please report back! Your favorite kong recipes and your T-day shelter stories are welcome. Above left: Vick dog 'Ellen' (now at Best Friends) investigates her first-ever stuffed kong back when she was still kenneled at the Hanover Pound in VA. What a treat. Animal Farm Foundation donated a boatload of kongs and goodies to the V-dogs back when they were still hidden from the world and it meant a lot to dogs and shelter workers alike. A group project. Lolo is home. Lolo - the bionic blue - is home for keeps, thanks to everyone who said 'Yes' to a once very out of luck foreclosure casualty and shelter dog. The work that went into saving this particular dog's life is above and beyond anything we've done as a collective before... Starting with the shelter that took her in, to Pit Ed Campers who first identified her as a dog with the right stuff, to the Badrappers who worked to keep her sane in the shelter while we sorted out her bad knees at several vet offices, to all the donors who helped pay her huge bill, to the foster home that raised their hand to help her recuperate, to the surgeon who did the marvelous work of making her whole again, to the Pit Ed trainers who helped her get her manners back in order once she was feelin' fat and sassy ... and finally, to Thomas and Meg, the Oakland couple who committed to making her part of their family. Whoops. We can't forget the two cats who are still not happy to be sharing a home with a blue ball of energy. Sorry, cats. Whew! Can we collapse yet? Lolo, you nearly wore us out but you were sure worth it. Welcome home, darling. To help you celebrate your own super star, photojournalist Nina Zhito has made a really generous offer: Every attendee who donates $20 at the door will be entered into a drawing to win a free photo session with Nina for your very own professional portrait. Double that donation and double your chance of winning. Nina is willing to travel to your favorite location for your shot. And if the photo just so happens to include our favorite breed, we'll publish it here for all to enjoy. The lucky name will be drawn at the end of the evening. Yep, yep - Another bust dog has landed safely in CA. I fear there may be yawns all over the place with more bust dog news, so I won't go into detail about this wonderful fresh arrival just yet. After all, Mikey (below) is just another one of dozens and dozens of dogs coming home from the "biggest-baddest-bust-eva." They're everywhere! "But what about our own LOCAL dogs-in-need?" GOOD QUESTION! The conundrum of choosing which lucky dogs get those rare foster spots is an important topic and a common theme during our weekly lunchtime meetings after Pit Ed classes. One thing's for sure, we aim to rescue at least one or two local dogs for every out-of-state dog we take in. That unofficial policy has been in place since back when we committed to ten Vick dogs. So the arrival of out-of-state Mikey signals a shopping spree for BR reps looking to fill a special foster home with a special local dog. In short, we're looking for a new ambassadog in the making. But with so many, how do you pick? 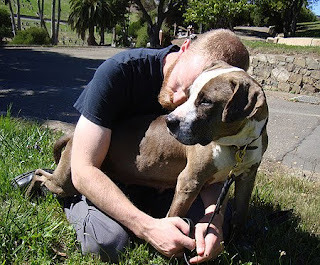 Here's the climate: In the SF east bay, pit bulls don't really need us like they did ten years ago. Strong adoption programs in our local shelters means the squishiest, most well-socialized dogs get snapped up quickly - without question. Even the "needs a little work" dogs find relatively fast homes. Nowadays, REAL pit bull rescue in the east bay involves taking dogs that have medical or behavior issues and then shining those rough diamonds up into little super stars. 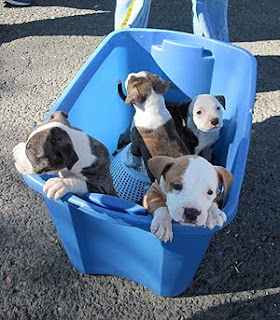 For example, in the past 12 months, we took ownership of over 30 dogs while working within Oakland Animal Services. 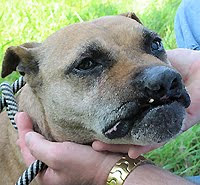 Eight dogs had medical problems that required either surgery or focused vetcare before they could be adopted out. Twelve had challenging but workable behavior issues that stemmed (typically) from lack of socialization or a good old fashioned proper upbringing. Six dogs presented unworkable behavior issues and were given compassion holds. And another six were 'easy keepers' who helped us train new volunteer handlers before they found their way to some very lucky, usually novice homes. So, here we go again...Scanning the shelters and comparing notes with each other on what we've seen. Who needs us the most? 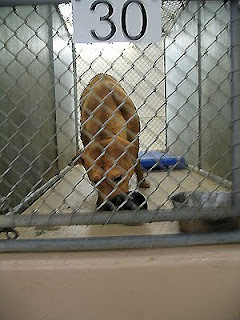 Should we go to the next county and save a highly adoptable dog that has near-zero options? Stick close to home and help a dog with issues? Scan our email for a desperate family in foreclosure? (tons of those) How do we balance out the personalities and sexes we already have? And - very important - how much vetting, training and socializing do we have the energy to do this time around? Easy keepers are like a happy vacation and a breath of fresh air to tired rescuers after placing one or two more difficult dogs. But then again, the difficult dogs are the ones that bring some of the biggest rewards. Sigh. It's a strange mix of privilege and burden to save a life. In the end, it's probably safe to say that we don't choose our rescue dogs. Rather, they always seem to find a way to choose us. Is it our imagination, or are there more puppies showing up at our Shots Fairs than in previous years? 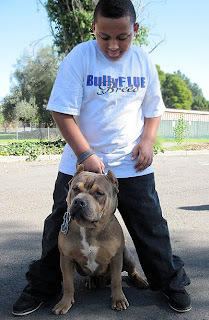 Our autumn outreach event took place in Vallejo this past weekend and attracted some of the town's busiest backyard breeders with their wares in tow, along with a plethora of the newest fad dogs - the American Bullies. 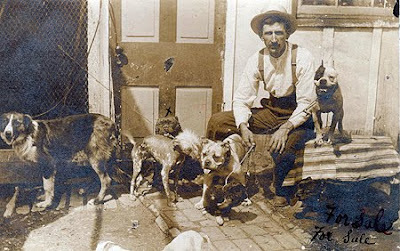 At least one backyard breeder admitted to subscribing to the age-old vocation of selling dogs to help make ends meet. With foreclosed houses on nearly every street, it gets hard to blame them. Below: Ye olde days. Not so different from today. Despite the head-bang that comes from seeing so many pups-at-risk, the Shots Fairs continue to give us hope. There's the shy family who marveled at how easy it was to teach their rowdy blue pup how to 'Sit.' And the moustached senior who brought his out-dated, wrinkled up spay/neuter voucher to exchange for an up-to-date voucher that he can use on his dog (Hey, time flies). Or the family whose dog was already spayed, but who stood in line just for training advice. We gave away dozens of free microchips, some puppy shots, spay/neuter vouchers, leashes/collars, educational hand-outs and a whole lotta advice. In return, we enjoyed a great day in the sun and some warm welcomes from Shots Fair clients. As we packed up and pulled out of the park, an older gentleman waved good-bye and hollered from his seat at a picnic table, "When are you coming back?" Maybe sometime next year. 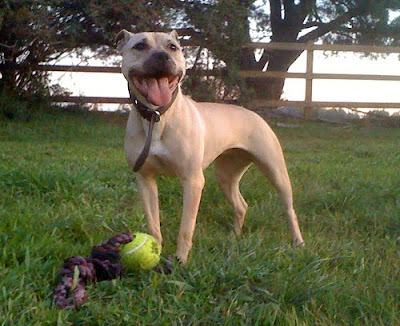 'Til then, we're scheming new ways to spread our resources around to the many different pockets of bay area pit bull owners that need a little help for their dogs. Thank you Vallejo. And good luck, little pups. Above, the steady-eddie Shot Fair crew after a good day's work. Thank you Kim and Christine for your organizational magic! When BR hit its big 10 year anniversary date back in April (April Fool's Day, natch), I was vaguely annoyed that we had to cancel our party plans in order to get out to Vegas to attend a much-anticipated meeting concerning bust dogs with the HSUS and other invested orgs. But that was a dumb response and only lasted until the fog lifted: "Party later. History is being made, you big dummy." Tipping point, and all that... And so the summer catapulted us into one of the most dizzying but gratifying periods ever of working in partnership with HSUS - yes, in partnership - as well as so many others to help dogs that were once considered hopeless. This tenth year of BR's existence has been filled with more pinch-me moments: Shelters in every corner are beginning to step up for their adoptable pit bulls. BSL fighters are finally getting the respect and support they deserve (thank you Brent Toellner) and even comedians with clumsy monologues about animal abuse are getting a karmic smack down. Ever since this pic of Hector made the news, photographers seem eager to capture a new view of the breed. 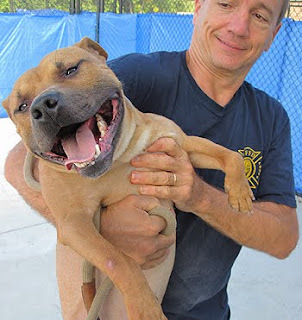 We've seen hundreds of images in the media since then that reflect a perspective of compassion - Not just for bust dogs, but anywhere where pit bulls are being embraced. It's as if suddenly it's cool to care. To help celebrate this incredible shift in consciousness, we've invited photographers from around the country to allow us to display their images all in one place. You need to be there. FOR ONE NIGHT ONLY: As part of our anniversary retrospective, we're honored to display the photos of talented photographers who showed the dogs to a waiting world. Including: Washington Post's own Carol Guzy, Associated Press photogs Eric Risberg and Jeff Chui (who captured MO bust dog images), William Widmer (who photographed the dogs for BARK Magazine), Deanne Fitzmaurice from Sports Illus fame, Tim Archibald from People Magazine, local talent Jesse Frieden (who has images of BR doing outreach and a compassion holds) and Andre Hermann. Many of the photos will be available for sale so you can own a piece of history. And we hear tell Vick dogs are busy autographing copies of Sports Illustrated mags for you to grab up. Doors open at 6pm, and it gets loud at 8:30pm when Thee Merry Widows will take the stage. This is a great opp to see Jonny Justice's new mom at work. Jennifer Long plays bass in this group, which Rockabilly Magazine describes "as trenchantly alluring a declaration of anti-socialiability as imaginable." Yes! That's our kind of music. Mark your calendar for December 5th's: BAD RAP's 10 Year Anniversary History is Made Benefit Celebration - Photo Exhibit and Rockabilly Concert with Thee Merry Widows At the Takara Saki Factory in Berkeley from 6-10pm. More INFO HERE -- WOOF! "They are not a vicious animal. They are the victims of abuse," said Debbie Hill, vice president of operations for the Humane Society of Missouri. "That face and their eyes tell the story. They only want to be in someone's home, on a couch, or sleeping at someone's feet, maybe chew up a rug or two for entertainment. They're learning for the first time how to be a dog." 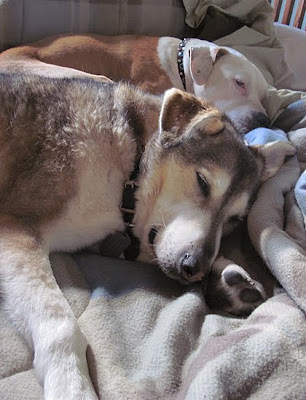 While many of the dogs are leaving for new lives, even more are being put to sleep. 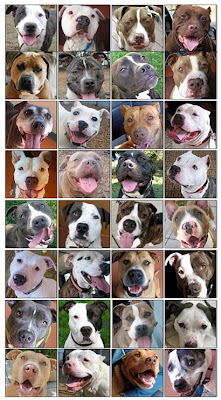 It's a bittersweet time for all the folks who've been caring for the dogs...our volunteers who committed to holding bust dogs during their passing, kennel workers like Karen at the Des Moines Iowa shelter who rightfully fell in love with every dog in her care, and of course the workers in the large Missouri shelter and elsewhere. The ASPCA will be providing grief counseling for the folks in Missouri as a way to help them heal. Here at home, we've got each other and a good bottle of tequila (thanks Bob) to take some of the sting out of the job of saying good-bye. To be honest, I wish we were closer to the midwest so we could help more of the dogs that have unworkable behavior issues. It's important that none of the dogs are blamed for their fate and every last one be shown the dignity they deserve. Barn-A-Go-Go: A new matching challenge! 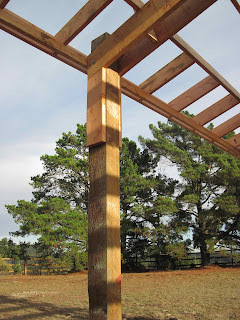 In between rescue work and conferences, the barn raising has been moving right along. 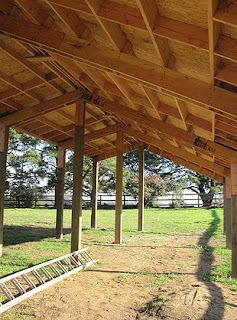 We've been able to get the roof on in preparation for the winter weather that promises to soggy up our work crew. Since our last update, we've raised a big fat $9607! towards the goal of making this project a reality. It was truly a pleasure to raise that bar up once again. We have thirty days to meet this challenge of $5,000, meaning that if we raise it, they will in turn donate $10,000 to us, making a total of $15,000. This amount of course puts us amazingly close to our final goal. So once again, the pressure is on. Can we raise $5000 in 30 days? It's a lot to ask, but we have faith. Let the challenge begin! BARNRAISERS. Look at all the people who want a better day for pit bulls. It restores hope, doesn't it? Holly Schneider, Linda Snyder, James Orvis, Daniel and Diane Alspaugh, Larry and Holly Dungan, Joette Martin, Rebecca Huss, Diane Rhodes, John & Brenda Starr, Roma-Dakini Alexander, Cheryl Banuelos, John and Ann Fornoff, Kimberky Baumback, Diane Andronovich, Luba Muzichenko, Jim and Patty Disiena, Barbara & Clarence Evans, Patty Marquez, Bryan Klavitter, Kathryn Hardy, Sarah Deluna, Rebecca Cowles, B A Laauterbach, Michael Harris, Merritt Tu, Cobalt Blues, Leila Gill, Ernest Lee, Josh Liddy, Laurie Metzger, Blue Fields Electric, Jennifer Aleah Nesteby, Carole Worthington, Janet Hurley, Damien Custer, Lisa Moeller, Jamie Cagle, Laurie Holmquist, Robert Stewart, Antone Sousa, Theresa Traylor, Daniel Kamalic, Anne Marie Suciu, Natalie Vietti, Heather Lucas, Melinda Shaw, Bonnie Burton, Gail Santos, Sherise Dobrin, Jason King, Majorie Samples, Leonard Raphael, Stefanie Hundenski, Fred Solis, Cahty Hanlon, Marisa Metala-Clendenen, Mitchell Buellesbach, Bailey Lee, Lisa Soon, Timothy Burns, Robyn Gillette, Stuart Fisk, Esther Shir, Dianne Rhodes, Adriana Aquino, Nicole Burris, Jessica Lamat, Aleksandra Gajdeczka, Beth Wawema, Abbie Ashce, Priscila Ibarra, Romy Nocera, Lyndon Parsons, Kimberly Baumback and Diane Androvich, Jennifer Al Mo. Thank you all so very very much! 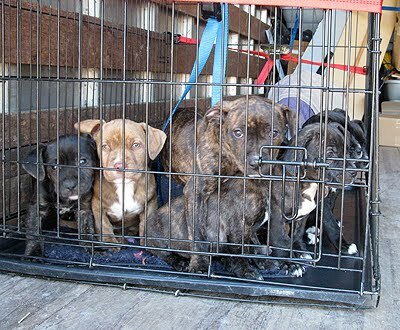 Bust dogs from the midwest are landing in rescues all over the country as we type. Some lucky ducks like our buddy Ernie here are already home for keeps. Siiigh...Ernie! (news later) In some cases, dogs are joining adoption programs. In others, special darlings are 'coming home' for the TLC of Compassion Holds. We continue to do a little of both, PLUS some exciting news: Plans are underway to bring a special lil' working dog to CA in prep for a job in law enforcement. Updates later - So much needs to happen before any of the bust dogs' stories can be told in full. One of the first dogs that left Missouri this summer (right) is starting her heartworm treatment. Her rescuer, Nicole Rattay of 'Just A Dog Rescue' sure could use a little love in the way of donations for vet care. Please check out her page on 'Gigi' and consider sending her your latte money this week. It would be heaven sent. VIDEO: Gigi meets her vet. Thank you dog lovers! One of the best parts of our job is meeting people who swim against the current to help nearly forgotten animals in their corners. In so many cases, those people are shelter workers who work to help those ostracized pit bulls without the cushion of a supportive community. (We are so spoiled in the SF bay area!) BR's sister organization - Partners in Shelter Services - has identified three diehards who went above and beyond to make positive change during tough times in 2009. Because it was the year of the bust dog, It just so happens that all worked to help the victims of cruelty in their shelters. Congratulations Jennifer Cummings (Claremore OK), Laurie Adams (Indianapolis IN) and Gloria Wheatley (Washington GA). Each award winner will receive $1000 to be used to help the pit bulls in their shelters. We're proud to know them and look forward to watching the ripple effect that they've put into motion through their words and deeds. 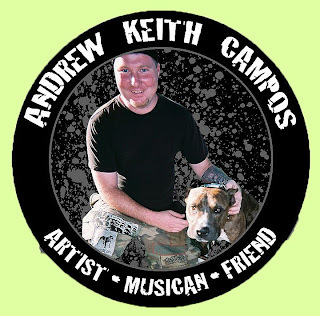 Keith Campos and his bandmates came to our rescue in a big way in the spring of '07 when our emergency medical fund for the dogs was running on fumes. They did a benefit show for BR at Gilman Street with four other bands that got us right on our feet again and showed everyone how much heart the punk rock community has for pit bulls. The top 13 most popular photos of the My Dog is Family photo contest are now in calendar form and ready for your walls. Let me tell you what a pleasure it has been to fall in love with your dogs and their stories thru this contest. Thanks to everyone who entered and racked up votes one dollar at a time, we raised 37K towards our general budget for 2010. Can you believe it! This year end report from '08 outlines how we spend your hard earned dollars. You can see why we're jumping for joy about the contest's success. Next in production, our ever-happy Happy Endings Calendar with your favorite BR dog faces in their new homes. And lining up: The My Dog is Family BOOK. If you entered your dog's image in the photo contest, you may be chosen to be in the book. Hang tight while we organize our hard-to-organize selves around this bigger project. When the Philadelphia Eagles were in Oakland, writer Christie Keith couldn't help but notice how many unaware people were waving the "Get over it!" flag over the animal lovers who decried Vick's visit. She wrote this article in response to those people who missed the gruesome details that are behind the outrage. If you visit BR's blog regularly, you probably already know more than you want to, but you may want to bookmark this piece for the next time you're forced to explain the obvious. Thank you Christie for bearing witness to the brutality so this most important national lesson isn't muffled by humming PR machines.